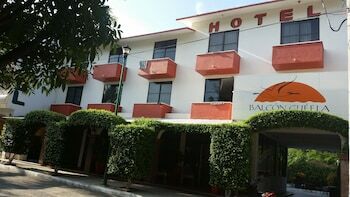 When you stay at Hotel Balcon Gueela in Huatulco, you'll be near the beach, within a 15-minute walk of Marina Chahue and Chahue Beach. Featured amenities include a 24-hour front desk, luggage storage, and a safe deposit box at the front desk. Guests may use a roundtrip airport shuttle for a surcharge, and free self parking is available onsite. When you stay at Suites Cervantes in Chihuahua, you'll be 13 minutes by car from Fashion Mall. Free self parking is available onsite. With a stay at Acamar Beach Resort Acapulco in Acapulco (Caleta), you'll be within a 10-minute drive of La Quebrada Cliffs and Playa Caletilla. Self parking (subject to charges) is available onsite. Located in Sayulita, El Nido is minutes from Sayulita Square and Sayulita Farmers Market.